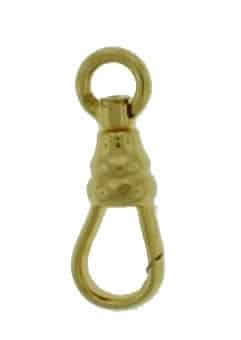 The swivel catch is a widely used jewelry safety catch that takes the form of an oval which is tapered on one end and can rotate around a lateral axis. Part of the catch can be pressed inwards through a spring mechanism but not outwards, thus an accessory may be quickly locked in place but cannot easily escape. (Mountain climbers use this kind of quick catch to secure themselves on a rope.) Most pocket watches were commonly suspended on a chain with a swivel catch. Other benefits are that it provides for a relatively safe catch when the spring mechanism looses strength and that the suspended item can rotate freely without twisting the rope or chain.